The photo on the left shows the property now known as 11 High Street, Thornbury about 1900. It was then known by the name of ‘Golden Key‘ a grocery shop run by Henry William Williams. “All that messuage or tenement wherein one John Mansell deceased formerly dwelt and wherein the said Matthew Meredith doth now dwell with a barn stable and garden to the same belonging situate lying and being in the Burrough of Thornbury in the said County of Gloucester bounded on the East part with a certain street called the Back Street on the Westward part with the High Street on the Northward part with a tenement lately belonging to one John Horwood and now to the said Matthew Meredith and on the South part thereof with a messuage and lands belonging to one William Greenwood which said messuage or tenement and premises were by Indenture of Lease and Release bearing the date respectively 30th and 31st August 1744 bought and purchased by the said Matthew Meredith to him and his heirs in fee of and from Susannah Whitfield Timothy Roach and Ann Roach (all since deceased)“. The detailed description of the properties on either side have enabled us to identify this property as 11 High Street. Based upon the Overseers of the Poor account books we believe that it had previously been part of a larger property which was divided into what we now know as 9 and 11 High Street. The earliest record showing the owner of the property was a borough rent roll suspected to have been prepared in the 1660’s. This appears to show the property as being owned by ‘Widow Bingham‘. The Overseers accounts records have enabled us to trace the ownership of this property back from 1667 when it was owned by William Smith. A bond dated 12th April 1654 between John Smith yeoman ‘of Hassell in parish of Olveston’ to the mayor and burgesses of Thornbury indicates that John’s brother, William Smith, was moving to live in Thornbury. The value of the bond was £40, presumably as surety that William wouldn’t become a burden on the people of Thornbury. William Smith was paying two and a half pence a month as poor rate from 1667 until 1683. In 1684 Margaret Smyth widow who was presumably William’s wife, paid the poor rate. The Mansells – in 1685 Phillip Mansell had taken over paying the rate of two and a half pence ‘for Smyths’. By 1686 the property appears to have been divided into two separate units (presumably corresponding to what we now know as 9 and 11 High Street). Phillip Mansell was paying one and a quarter pence per month ‘for Smyths’. Jonathan Barton was paying one and a quarter pence for the other part of the property. In 1688 to 1690 the proportions each person paid changed slightly: Phillip was paying one and a half pence and Jonathan paying one pence. We believe that Phillip’s property was 11 High Street and Jonathan Barton’s became 9 High Street. In his will dated 6th August 1725 he referred to ‘all that my messuage or tenement wherein I now dwell situate in the borough of Thornbury and all houses outhouses edifices buildings barns stables gardens orchards yards and backsides thereunto belonging’ and ‘also the Wainehouse I lately built in the Back Street in the said borough of Thornbury and near adjoining to the barn and stable belonging to my said messuage‘. This property was left to Philip’s son, John Mansell. The main property appears to be 11 High Street. We think the ‘Wainehouse’ might refer to the building known today as the Malthouse in St Mary Street. Solomon Roach – the Overseers accounts from 1735 to 1743 show Solomon paying one and a half pennies each month ‘for Mansells’. The records show he also owned another property for which he was paying one penny three farthings each month. This second property is also shown in some years as ‘for Mansells’. The parish records show that Solomon Roach was baptised on 23rd September 1700. He was son of Timothy Roach. On 18th August 1740 Solomon married Ann Penduck. We note that Hester, Solomon’s sister, had married Jonathan Penduck in Thornbury but she had died on 27th December 1723 aged 20 years and 10 months. Solomon was noted to be a yeoman when he was a witness to the last will of Robert Whitfield in 1741. Solomon was buried on 30th May 1744. In his will dated 27th May 1744 Solomon left two properties. The one in the High Street he left to his brother, Timothy Roach. This property was occupied by Solomon’s aunt, Susannah Whitfield, at the time he wrote the will and Timothy was instructed to convey to her the property for £30 “which he ‘stands jointly engaged with her for with such money as I expended on repairing the same premises’. Timothy was also to be given Solomon’s best horse and one guinea. Solomon left his brother-in-law, John Child, sorrell horse and his best suit. He left his wife, Ann, his second property, the one in Sibland, in which he was living and which he had recently purchased from Thomas Rouse Esq and the rest of his estate. The property at 11 High Street was sold to Matthew Meredith in August 1744. We note that there was an Ann Roach who was buried on 11th September 1744. She might have been Solomon’s widow, but the Overseers Accounts up to and including 1746 show ‘Ann Roach’ or ‘Widow Roach’ as the owner of the other property (presumably the one at Sibland) for which she was paying one penny three farthings each month. Matthew Meredith – acquired it in 1744 from the heirs of Solomon Roach. He also bought the property next door (9 High Street) from John Horwood and his wife, Hester by indentures of lease and release dated 13th and 14th April 1750. On 2nd October 1759 Matthew arranged a mortgage on both of his properties and at that time he was living at 11 High Street. The property at 11 High Street was described as: “All that messuage or tenement wherein one John Mansel deceased formerly dwelt and wherein the said Matthew Meredith doth now dwell with a barn stable and garden to the same belonging situate lying and being in the Burrough of Thornbury in the said County of Gloucester bounded on the East part with a certain street called the Back Street on the Westward part with the High Street on the Northward part with a tenement lately belonging to one John Horwood and now to the said Matthew Meredith and on the South part thereof with a messuage and lands belonging to one William Greenwood which said messuage or tenement and premises were by Indenture of Lease and Release bearing the date respectively 30th and 31st August 1744 bought and purchased by the said Matthew Meredith to him and his heirs in fee of and from Susannah Whitfield Timothy Roach and Ann Roach (all since deceased)”. Thomas Ford (or Foord) – the Overseers accounts in 1773 show Thomas Ford or Foord has replaced Robert Pountey as tenant. “Thomas Clark doth hereby acknowledge testify and declare that the said sum of £130 purchase money paid to the said Matthew Meredith and Lucy Maria his wife as a foresaid was the sole proper money of the said George Rolph and that the name of him the said Thomas Clark was made use of in the first mentioned and recited indenture of lease and release only in trust and to and for the only benefit of the said George Rolph his heirs and assigns and to be granted and conveyed to the said George Rolph his heirs and assigns or such other person or persons a she or they should direct or appoint and to and for no other use intent or purpose whatsoever“. Note the Overseers Accounts refer to Thomas Clark as owning the two properties in 1770 to 1773 and the Land Tax records up to 1782 are still showing Thomas Clark as the owner. The paragraph above shows that George Rolph was the actual owner of both properties. In 1770 the property at 11 High Street was still being occupied by Robert Pountney, but by 1773 Thomas Ford had replaced him. The land tax records from 1780 to 1784 also show Thomas Ford as being the tenant. In his will dated 1792 George Rolph left to ‘daughters Susannah and Hester by the said Susannah my former wife ‘all that messuage or tenement wherein Robert Pountney deceased heretofore inhabited and Sarah Peters widow doth now dwell with the garden and appurtenances thereunto belonging which said garden is now occupied by my said daughters and also all that messuage or tenement adjoining to the northward part of that last mentioned and where in Mary Clarke widow lately inhabited and my said daughters do now dwell both adjoining to the Fore Street of the said borough on the eastward side of that street with all out houses …..etc together with the malt house thereto or near thereto adjoining situate in the Back Street of the said borough and now rented of me by Mary Greenwood widow which said two several messuages or tenements malt house and premises last mentioned are all adjoining together and were by me purchased in fee simple (with other hereditaments ) of the said Mathew Meredith‘. The first property mentioned refers to 11 High Street, the second to 9 High Street. The land tax records from 1796 to 1810 show Susannah Rolph as the owner. From 1812 onwards it was owned by the Rolph Yates and Co. Bank. Sarah and Mary Peters – at the time that the owner George Rolph wrote his will in 1792 he mentioned that the property was occupied by Sarah Peters, a widow. We suspect that Sarah was the Sarah Somers who had married Llewellin Peters, a dissenting minister. The marriage took place at Berkeley on 26th December 1757. At that time they were living at Wickelm, a large house just outside Berkeley (near the old railway station). Llewellin had died in 1784 when the family were living at Swanley. He was buried in Berkeley on 15th March 1784. ‘Mrs Peters’ is listed as the tenant of Susannah Rolph in Thornbury in the 1796, 1797 and 1800 land tax records. We don’t know what made Sarah move to Thornbury. She died there and was buried on Berkeley on 6th January 1801. Sarah’s will left the house in Swanley to her daughter Mary. Mary Peters was listed in the 1809 Rent Roll as living at 11 High Street. We suspect that she was living in one or more of the rooms on the upper floors above The Bank which was opened in the property in 1808. Mary was the daughter of Llewellin and Sarah Peters and when she died aged 59 she too was buried in Berkeley on 7th August 1818. In her will Mary left the house in Swanley to her cousin Ann Harford, wife of William Harford of Almondsbury and then to William Summers the natural son of Ann Harford. The Bank – in 1809 Rent Roll clearly says that the ‘Rolph’ Bank occupied this property with Mary Peters (see above). We assume that Mary Peters was occupying one of the rooms on the upper floors. The property at that time was owned by Susannah Rolph, the sister of the bank’s founder, George Rolph. The archives of the Royal Bank of Scotland shows the bank in Thornbury traded under various names in the early years as the partners in the bank changed. These included: Rolph & Co in 1808, Rolph, Yates & Co by 1810, Rolph, Yates & Parslow by 1812, Parslow, Rolph & Co by 1820 and Rolph, Yates & Parslow by 1841. The bank continued to occupy these premises until about 1858 when it moved to the new bank built on The Plain. The 1840 Tithe Survey shows the property as Plot 194 a Banking House and Yard owned and occupied by ‘Parslow and Rolph’. The 1841 census gives the impression that Joseph Laver, the bank’s clerk who living in the premises, presumably in the upper floors. He was aged 65 and was living with his wife, Louisa aged 60, daughter Maria aged 20 and Eliza Lippiatt a female servant aged 15. Joseph owned the two properties (7 & 9 High Street) which he appears to have bought from Susannah Rolph. The 1851 census suggests that Joseph’s son, Henry Willis Laver was living above the bank. He was a medical practitioner married aged 43 born in Bristol. Although the bank had moved to The Plain by 1858, the 1859 and 1862 shows that the ‘Harwood & Co Bank’ still owned the property then being let to ‘Miss Laver’. The 1861 census shows Mary Louisa Laver, the daughter of Joseph and Louisa Laver was living there. She was described as an unmarried governess aged 35 living with a cousin Jane Temperance Brookes who was also a governess aged 28 born in Ross, Herefordshire, a boarder Tom A Taylor a scholar aged 5 from Bristol and a house servant, Anne Barnfield aged 25 from Cam. Edwin Boyes Lonnen – the 1876 Rate Book confirms that Edwin was the owner and occupant of 11 High Street. He was also the tenant of the shop at 9 High Street which was owned by Henry James Dodd. He was a draper and grocer from Poole. Henry Williams and the Golden Key – by 1899 Henry Williams had moved into occupy the property, renting it from his father. He opened the business as the Golden Key trading as a grocer and tea dealer. The 1901 census shows Henry as a grocer aged 28. He was living at 11 High Street with his wife, Louise C aged 27 from London and their son, Leslie J. M. aged 6 months. We suspect that it was Henry, or his father, who had the property re-developed. William Charles Hadley – we have a photo taken in the early 1900’s showing the name of ‘W. C. Hadley’ on the sun awning. The 1918 and 1921 electoral registers list William Charles Hadley and Emmeline Lucy Hadley living in the High Street. William was born in Cam in 1882. He was the son of Charles Hopton Hadley and Emma Nicholls. The 1901 census shows Charles was the innkeeper of the Berkeley Arms in Cam. Young William had started working as a grocer’s assistant. The 1911 census shows William’s father had died, and his mother, Emma, was running the Berkeley Arms. William was now a grocer’s manager still living at home. In 1911 William married Emmeline Lucy Bennett. They had one child, Percy G born in Dursley area in 1913. By 1912 they had moved to Thornbury. The log books of the National School (now St Marys) shows Emmeline Lucy Hadley worked at the school as an uncertificated teacher from 5th April 1912 to 1st August 1912. She was covering for another teacher who was absent. She also covered for a teacher between March and July 1913. An 1914 trade directory and 1916 Prewetts Directory shows William as a grocer in St Mary Street. In September 1916 William applied for exemption from military service on the basis that his business would close if he were called up. He was then living in St Mary Street. He was granted conditional exemption subject to him joining the Volunteer Corps. An indenture dated 16th December 1916 shows that William was the tenant at 21 St Mary Street, a property being sold by the Burchell family to William Eyles. They had a daughter, Joyce Emmeline born in Thornbury on 7th February 1915 and a son, Arthur William Hopton born there in 1919. The 1918 electoral register shows the Hadleys living in the High Street, presumably at 11 High Street. They were still there when Joyce started at the Council Infants School and in 1922 when she moved up to the Upper School. The family seems to have moved away later in 1922 when Joyce was removed from the school. We don’t know where the Hadleys went although we know that they were later living in Leonard Stanley near Stroud. Emmeline died there in 1955 aged 73 and when William died at Bath Road, Leonard Stanley on 17th May 1966 the probate record described him as ‘of Corner Stores, Leonard Stanley’. Williams’ executors included his son, Arthur William Hopton Hadley, grocer. International Stores – the 1925 Valuation List shows that the property at 11 High Street was owned and occupied by International Tea Company who were trading under the name of International Stores. The Company known then as the International Tea Company, was founded in 1878, initially with the objective of selling tea direct to consumers rather than through wholesalers. In 1895 it changed its name to International Tea Company’s Stores Ltd and became a major chain of grocery stores and later supermarkets. “Observant Thornburians towards the end of the War, would have noticed how these subjects were increasingly being discussed in public and by 1945 people were, literally, standing on soap boxes to air their views and in some cases, to rant and rave! As a keen supporter of my war-time hero I could not believe what I was hearing. The quiet, normally unassuming manager of the International Stores, for example, a Mr Moon, was one kitten who turned into a lion! His performances as a rabble-rouser under a street light in St John St had to be seen to be believed. The little mouse in a brown overall who had served my mother with biscuits and sugar and tea had, in my opinion, turned into a left-wing demon!“. Below we have four thumbnail photos of the shop. Click on each thumbnail to see a larger image. The first photo was taken in 1963 when the shop was flanked by Hodders, the chemists and Wilkins the drapers. The shop front shown in the photo was typical of the shops in the International Stores chain. 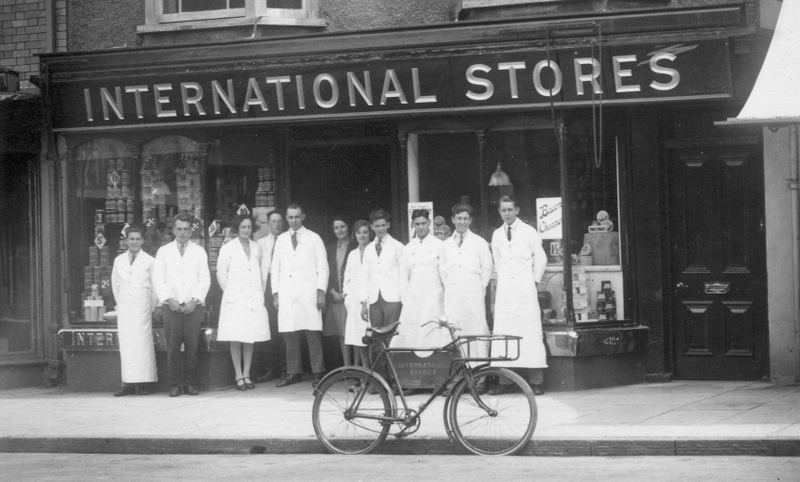 The second photo shows the staff standing outside the original International Stores shop. Donald Hughes, is one of the members of staff. He joined the shop on an apprenticeship and worked there until 1935 when he went into the Services. We also know that Alan George Poole, the son of the Frank Cullimore Poole, the photographer was manager at the shop for many years. Ron Pearce, the son of Harold Pearce, the baker, also started working there as a delivery boy. 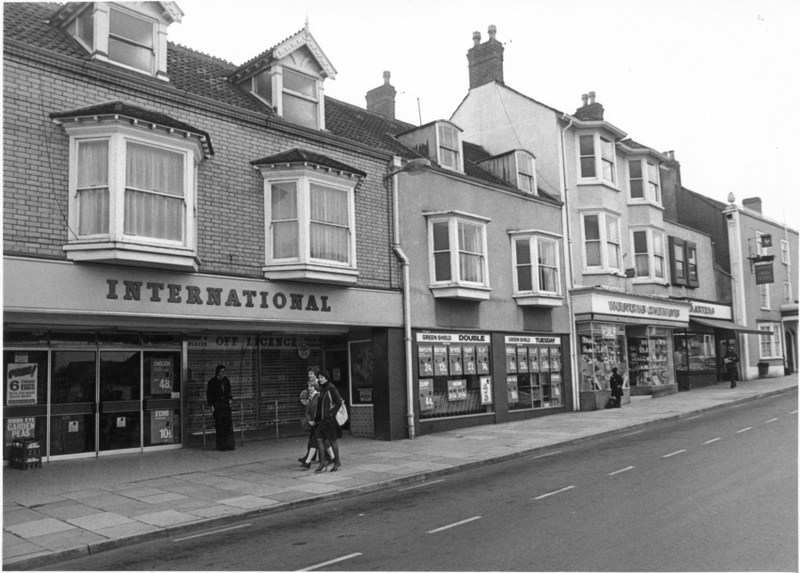 The third photo shows the shop in 1968 when the shop front had been modernised. The fourth photo taken in 1981 when the shop had been extended to include the shop at 9 High Street. The new store became a proper ‘supermarket’. We haven’t got many records of the other families who lived in the apartment above the shop. We know from the electoral registers the names of two families who lived there: John and Cicely Owens in 1954 and 1958 and Edmund and Joyce Holmes in 1961 and 1965. We don’t know if they had any connection with the shop. We are not sure when the International Stores closed. In more recent years, the shop has been used by Creative Designs, by Choices Video and is now a popular coffee shop trading under the name of Coffee#1 opened about 2010. We’d love to hear from anyone with any knowledge of the property or the families who lived there.